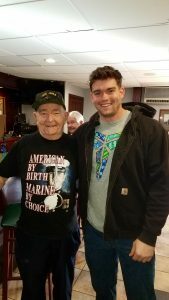 When this year’s Rockland County St. Patrick’s Day Parade proceeds down Central Avenue in Pearl River, it will be led by Marine Corps veteran Francis T. Duffy. Frank was awarded the Silver Star for “conspicuous gallantry and intrepidity” in a battle where Admiral Nimitz noted that “Uncommon Valor was a Common Virtue” indicates the high bar that Frank’s courage met on that day. Because of his actions, he would also be awarded the Purple Heart and spend a year in hospital recovering from wounds he sustained in defending his country and fellow Marines. the battle was won not by Jones on the deck, but by one of his Irish Marines crawling out to the edge of a mast to drop a grenade into the Serapis’ hold that won the day. In the United States first international military encounter, the Barbary War against Algerian pirates who were capturing U.S. Merchant vessel and enslaving their crews, the U.S. Marines who fought on “the shores of Tripoli” under the command of Lieutenant Presley O’Bannon. 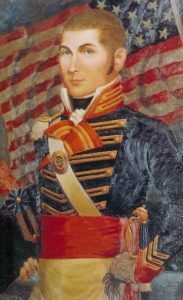 Leading a detachment of seven Marines and two Navy Midshipmen, at the Battle of Derna, O’Bannon and his Marines “pass’d through a shower of Musketry from the Walls of houses”, took possession of an artillery battery and turned it on the defenders. O’Bannon would become the first to raise the American flag on foreign soil after combat. In recognition of his bravery, the Pasha of Tripoli presented O’Bannon a Mameluke sword as a token of respect; Marine officers have been wearing one ever since. 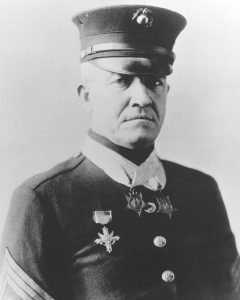 Danial Joseph Daly was a small man at only 5’ 6”, but would be described by General Smedley D. Butler, himself a Marine legend, as “The fightinest Marine I ever knew.” Daly was awarded the Medal of Honor during the Boxer Rebellion where he single-handedly held a position against an overwhelming assault by hundreds of the enemy. Fifteen years later as a Gunnery Sergeant, Daly and his men were in Haiti when they were ambushed. Daly braved enemy fire to retrieve a machine gun that was still strapped to a mule that had been killed, thereby saving his men and was awarded a second Medal of Honor. Ironically it is for neither of these incidents for which he is most famous. In WW I, Gunnery Sergeant Daly and his men were pinned by artillery and machine-gun fire near Belleau Wood. Realize that to stay in this position was certain death, the now 44-year-old Daly stood up out and with a battle cry that has begun legend said: “Come on, you sons of *******, do you want to live forever? !” Daly personally eliminated a machine gun nest with nothing more than his pistol and grenades, being wounded three times in the process. He was recommended for a third Medal of Honor, but a Washington bureaucratic denied it solely on the basis that he already had two. In WW II, fighting alongside Frank Duffy on Iwo Jima was Captain Joseph Jeremiah McCarthy who earned the Medal of Honor. After the war he would travel the country visiting the families of each of his men who had fallen where he personally assured the families that their loved ones were just as brave as he was, he was just lucky. In Korea 28 Irish immigrants would be killed fighting for their adopted country including Pfc. John Patrick White, born in Caherdaniel, County Kerry. That the Korean War has earned the nickname “The forgotten war” is an outrage, that America forgot these men for half a century to grant these men who died wearing her uniform before granting them citizenship a scandal. Robert Emmett O’Malley and Thomas Patrick Noonan were born within five months of each other in the historically Irish enclave of Woodside, Queens. The two-attended school and church together and were close friends throughout childhood. They both joined the Marines, and both earned the Medal of Honor, Noonan making the supreme sacrifice. Sgt Liam Anthony Flynn emigrated to New York from Clane Co Kildare in 2002 and joined the US Marine s in 2006. He served four tours of duty in Iraq and Afghanistan before being killed in a training accident as part of Special Forces command.